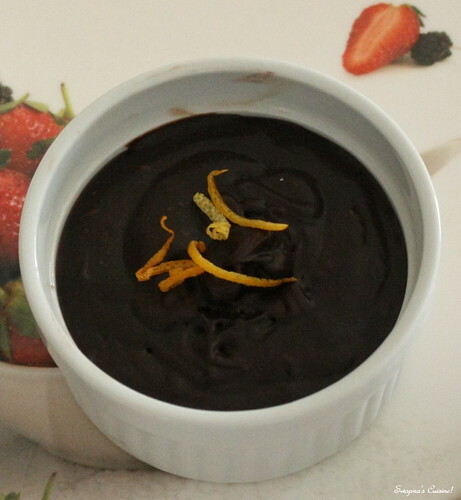 Swapna's Cuisine: Instant Eggless Chocolate Mousse! When you haven't got time for overnight setting in the fridge or you don't want to use raw eggs, this mousse is perfect. Put the marshmallows, butter, chocolate and water in a heavy-based saucepan. Put the saucepan on the hob, over heat, though keep it fairly gentle, to melt the contents, stirring every now and again. Meanwhile, whip the cream with the vanilla extract until thick, and then fold into the cooling chocolate mixture until you have a smooth, cohesive mixture. Pour or scrape into individual glasses or ramekins, and chill. Looks dark, rich and delicious! I made the same a few months ago, but it wasn't as dark as yours. Did you use 90% cocoa solids? I used 75%. I know how good this one tastes! LOve it! Looks awesome. I love NL's recipes. The clicks are awesome. Eggless mousse looks yummy and droolworthy..